The past few months have been a bit of a blur. In the midst of getting pregnant and moving house, it’s also been an exciting time at my job. I work as UX Lead at RiksTV and a while ago we started making plans to launch a brand new streaming service in Norway. We felt like it was time for a product which bridged the gap between Netflix style streaming platforms and more traditional cable TV providers. We believe people should be able to sign up and start streaming without being locked into a contract, having to pay annoying set up fees or connect extra equipment from what they already have, and that it would be great if they could also enjoy content across live cable tv channels in the same place that they watch their favourite on demand series. Together with some colleagues from RiksTV we have been working with consultants from Bekk, Novanet, and Itera. Our team has consisted of mostly developers, but also designers, branding experts, project managers, and marketers. My role in the project was to design the user experience. We have worked as agile as possible, with focus meetings each week in which we discussed and prioritised tasks so that we could constantly release, test and evaluate. This helped us focus as a team, iterating over features quickly and productively. Building a product from scratch gave us a lot of freedom. We moved really fast, broke everything, learned a lot, fixed stuff, and nobody got hurt because we didn’t have any paying users yet. We used Trello as our planning tool, with the classic ‘to do’, ‘doing’ and ‘done’ lists, however we incorporated some ‘lean extras’ into the mix too. We split the to do list into two: backlog and current focus, and added a list for things that were in test. The current focus list was basically a prioritised backlog of things to be done that week. We started every Monday with a focus meeting in which we archived all cards from the ‘done’ list and discussed what we should do next. We also had daily stand ups so that we could quickly sniff out if anything was holding us back, and get a good overview of what tasks we each were working on. Our customised approach to lean project management worked well for us, and we tweaked it as we progressed, adding work in progress limits to the columns and occasional retros and other lean ceremonies as we needed them. If you are reading this and wondering what the hell I am talking about you can read about lean methodology here. Designing Strim was interesting. We decided to start with a browser player as our first product. We wanted to get a first version of the product out fast so we decided to duplicate elements from our existing RiksTV browser player as a starting point, adding a sign up process and a landing page. There were two other designers here for a while working on branding concepts whilst we started on all the technical tasks. We did a lot of workshops and research to figure out how the brand should be and ended up with an exciting and modern visual profile. I worked with the team, making paper wireframes to map out ideas for a sign up flow, and used Sketch integrated with Zeplin (which was then Integrated with Slack) so that the whole team could collaborate and discuss design work constantly, I find these tools help the team immensely. It is important that everyone is part of the design process. It wasn’t long before summer was upon us, and we knew that we couldn’t really launch a streaming service you can only use on your computer. Everyone else on my team was heading off on holiday but there were a few of us around and so we began a summer project to make a Strim Android app. We used Facebooks own framework for building native apps: React Native and I used Google’s new Material Theming guidelines to quickly put it together. I have to say that I found it so satisfying to work with Material, and that the Material Theming plugin for sketch is a LOT of fun. If you are an app designer and you haven’t tried it yet you can get it here. The rest of the team came back from their holiday and were surprised to see how far we had got with the app. In only a few weeks we had included most of the functionality, and content we had in the browser app, and it looked slick too. Since then I have also designed a Strim iOS app and a tvOS app. It has been a challenge to juggle designing for 4 different platforms at the same time, but I seem to have managed because really the whole team has been designing the user experience with me. That’s partly thanks to our project management and design tools, but also because I’ve been working with people who are not afraid of getting creative and involved in all parts of the project. 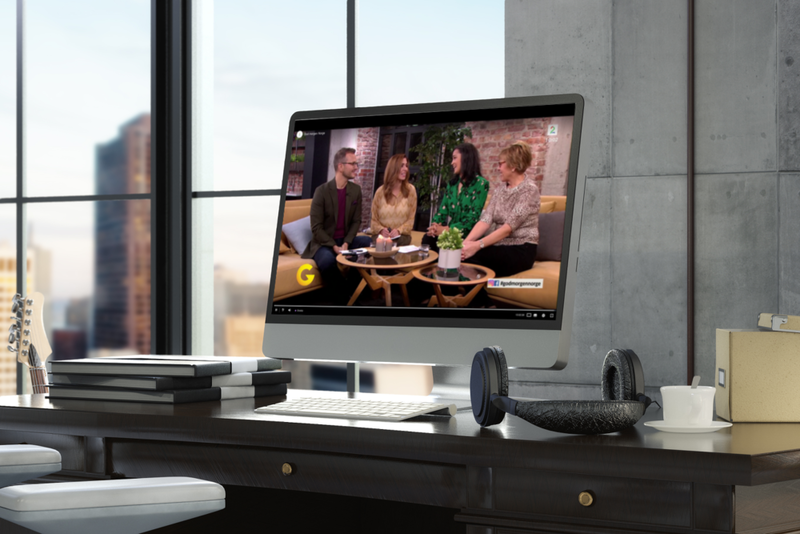 Last week we launched Strim, and it was very well received by our partners HBO Nordic, TV2, Paramount, Discovery, and Disney, as well as other key players in the media world. We also have our first proper paying users, and are enjoying great feedback. It’s an exciting time for us, as we see so much opportunity to develop Strim’s features, include more content and expand the team too! My nice French boss Jérôme (bottom left) and some hot shot TV people at our launch party. I probably can’t say what is next for Strim, but I can say that I’m having fun designing it! We are offering people a 7 day trial period, which is good to know if you are curious about trying it out. If you do please let us know what you think about it, if there are any features you miss and your thoughts on what the future of TV looks like. UX Designer specialising in iOS & tvOS apps. When I’m not making apps I’m baking cookies, reading books, writing stuff, or in the gym. I live in Norway with my boyfriend and three stinky cats.